Maca (Lepidium meyenii) is grown at high elevations in the Andes region of central Peru. It has been used for centuries by indigenous Peruvians as a food source, as well as for increasing stamina and energy. More recent scientific studies have demonstrated that Maca supports hormonal balance and both male and female reproductive health. 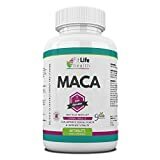 Maca, 500mg Supplement Facts: Serving Size: 1 Capsule Serving Per Container: 100 Amount Per Serving: Maca (Lepidium meyenill) (Root) 500 mg Maca, 500mg Other Ingredients: Gelatin (capsule) and Magnesium Stearate (vegetable source). Maca, 500mg Recommended Use: As a dietary supplement, take 1 capsule 1 to 2 times daily. Warning: Do Not Eat Freshness Packet. Keep in Bottle. Carnitine plays an essential role in making fatty acids available for muscle tissue.